The term is applied to the wartime five-cent piece (1942-1945) composted of 56% copper, 35% silver and 9% manganese. Because nickel imparts great strength and corrosion resistance to steel, and because the United States must import most of its nickel, it was decided to reserve the stockpile of that metal normally employed in the production of five-cent pieces for the use of the war industry. 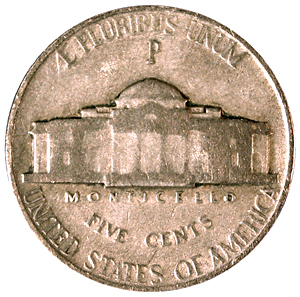 To indicate the change of alloy, the mint mark was made larger and placed above the dome of the Monticello, and for the first time the nations's coinage history, the letter "P" was used to designate domestic coins struck at the Philadelphia Mint.